Officials are looking into building a new bridge across Lady Bird Lake to ease bicycle and pedestrian congestion on the Pleasant Valley crossing. There are enjoyable ways to walk or bike across Lady Bird Lake, but the Pleasant Valley Bridge is not one of them. 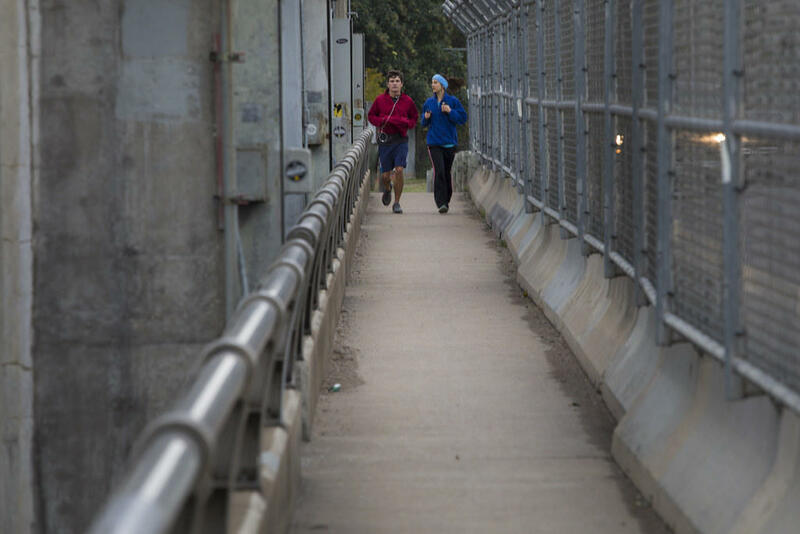 A narrow sidewalk, a chain-link fence and low guardrails are features that make the East Austin crossing unsafe. For years, the city has floated ideas to improve the crossing, with no results. Now, an effort is underway that may eventually lead to a whole new pedestrian bridge. That initiative was kicked off last week at a public meeting at Fiesta Gardens, where the Transportation Department asked for input on potential new crossings. There were poster boards for residents to write down input and maps to draw their preferred locations. While attendees were asked to let their dreams run wild, some options seemed more likely than others. One suggestion was a bridge some distance from the current crossing at Pleasant Valley Road, running from the Peace Point peninsula on the south shore – near the new Oracle campus – across the lake to Festival Beach on the north side. Another possibility was putting a bridge just up- or downstream of Pleasant Valley Road. “Widening the existing bridge would be our fourth [option],” Wilkes said. Each of these options comes with challenges. Those challenges come into focus when you take a look at the structure the current bridge sits on: the Longhorn Dam. The dam has a long history of mechanical problems. Wilkes said any new bridge on or near that structure could be complicated by work the city needs to do on the dam. A new bridge right upstream from the dam would also need to be up to 17 feet above the usual lake level to protect it from flooding. The Pleasant Valley bridge's narrow sidewalk, low guardrails and chain-link fence make it unsafe. There's also the question of what location will get the most community support. A few years ago, the Parks Department floated a plan for a bridge upstream of the dam, which was similar to the Peace Point option presented at the meeting. That proposal met with resistance from neighborhood groups, who ended up backing a different plan to attach a bridge to the existing dam. It appears some still view the proposal for a bridge near the Oracle campus as part and parcel of East Austin’s gentrification, though that didn't come up at last week's public meeting. Attendees of the meeting seemed to overwhelmingly support the project, though there was disagreement over the type of bridge to build. “I would love to see an incredibly designed, artfully minded bridge," said Rose Warren, a transportation consultant who lives nearby. “I would like a fast option," said Anna Kehl, who also lives in the neighborhood, "something that could be done quickly and that could be utilized soon." But right now, the debate over cost is highly theoretical. The fact is, funding is still years away – if it comes at all. “One thing I did find out is [there's] no funding. ... So, [we're] moving forward!" chuckled longtime Eastside activist Gavino Fernandez. The Transportation Department plans to review community input and hold a second public meeting. Then it will come back for a third event before it starts looking for funding. In the meantime, the city is looking at fixes to the Longhorn dam crossing that it could implement sometime within the next year. A new island has risen up near the boardwalk on the south shore of Lady Bird Lake. I noticed it on a recent jog, and I’m not the only one. The invasive zebra mussel has been moving south for years, leaving destruction its wake. Now, it’s in Lake Travis (update: and Lake Austin), and it will soon make its way downstream, changing the look, feel and maybe even the taste of Austin’s lakes forever. After a new study showed thousands of additional homes were at risk of flooding in Austin, the city is preparing to revamp rules on building within a floodplain. The study, known as Atlas 14, revised the city's understanding of historical rainfall data, adding 3,000 properties to the city's 100-year floodplain – which impacts everything from what people pay for insurance to how they can build homes.